I know. I've know "I'm In" for a while, but when this came in the mail this week I still got excited. 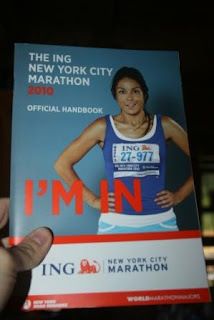 Add that to the current issue of Runner's World magazine which is full of tidbits about the NYC marathon, and I'm jittery with excitement. At times, I can't sleep at night just thinking about it. 21 days! Today will be my last long run (and the coolest of all my runs so far - temps are finally feeling like fall). The 20 miler. Some might say the dreaded 20 miler. But I try really hard not to think of it like that. The night before, I make sure I have new podcasts on my Ipod and I load up my fuel belt with water, Gus (I prefer vanilla) and a few Luna moons (little gummy chews). I make my pb+j which serves as breakfast before I head out, and I lay out my clothes. In this way, I just get moving as soon as I get up and don't stop to think about what I'm about to do. I just go. Hopefully it'll go smoothly and then I'll be ready to start tapering for the big day. I'm a little nervous about injury - tapering can lead to lots of twinges and so forth. I'm also worried about logistics - getting to the race line that morning and finding my start corral. I know I can run the distance - I've done the training; it's just all the little details that get me anxious. whoo hoo!! so excited for you! I can't WAIT for you to go! Remind me to send you my cell # in case you need me as a go-to resource. :) And if you need any info beforehand that I didn't cover in my interview post, let me know that, too! Sounds like it's gonna be a great trip!! I know you will do great!! That first comment must be your mother or dad - how cute. Well I am with you too - wishing you the best. I know you're excited. I'm proud of you too. Very interesting to hear what you eat. I figured rocket fuel or something...who knew my pb&j was marathon food! Yay! Can't wait to hear all about it!